We landed in Kolkata at midday, flying from “Darj” (after four days in Darjeeling, we’re referring to it like locals now) into this smoggy metropolis of 14.4 million people, the 18th largest city in the world. Makes your own city seem like a sleepy backwater, doesn’t it. 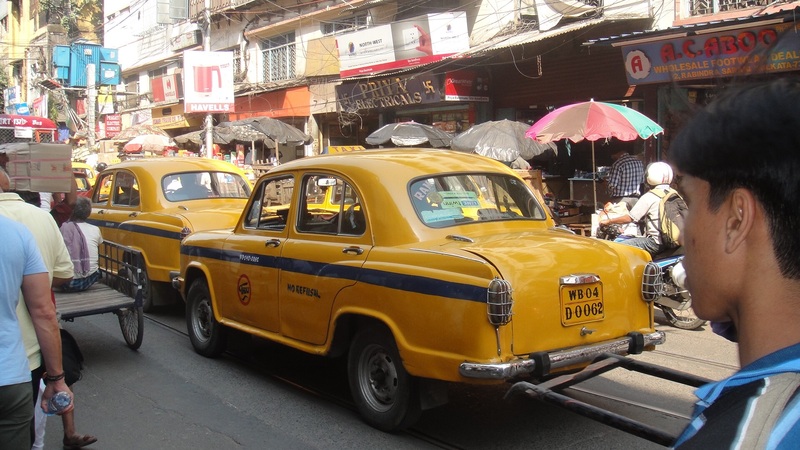 We finally got to travel in the famous Hindustan Ambassador taxi. A car straight from the 1950s, resembling an Oxford Morris Minor. The amazing thing is this bright yellow cab hasn’t changed its design since then. The Indians have taken the saying “If it ain’t broke, don’t fix it” to extremes. No A/C, radio, shock absorbers, electric windows … but now fitted with indicators, and of course the must-have horn. Unfortunately, our backpacks wouldn’t fit in the boot; the boot was slammed down, only to bounce back up. My look of concern was greeted by the ubiquitous head wobble of the taxi driver and we were off. In defence of our non-English speaking driver, he did stop repeatedly at traffic lights and get out to check that our bags were still intact. Only Krishna knows what he would have done if he found the rusted out cavity of his trunk empty. In this city of 1900 square kilometres, he did manage to find our hotel, oh, and several other hotels along the way that he thought we should be staying in. My first impression as our battered yellow Ambassador taxi took a shortcut through a labyrinth of lanes, was, if for some reason we were dropped on the street, it may take me years to find my way out, if ever! We dipped our toes into Kolkata straight away, with a one block walk to the nearest five star shopping mall. I know it wasn’t a daring move, but even that five minute walk involved being almost run over by a speeding truck and stepping over dead rats, dog caca and the usual street-stained sleeping bodies. Feeling slightly reassured and braver after this short foray into the chaos of Kolkata, we then attempted a several kilometre walk to another shopping mall along the streets – literally. Footpaths are hit and miss in this city; sometimes accessible, at other times covered in pop-up tea shops and food stalls. It was peak hour and Kolkata was throwing all that she had at us. Like the streetwise and brave men we are, we made each terrifying street crossing in the shadow of some old lady or mother with child (they cross at a slower pace and are less likely to take unnecessary risks). We never found that mall; Park Street Circus, with its steady stream of trucks, buses, tuk tuks, bicycle rickshaws, Amassador taxis, scooters and motorbikes all converging on a single roundabout with its six entry and exit points was too much, and we admitted defeat. We did, however, find The Maidan and took sanction in the green of the park with its hundreds of different cricket matches taking place. I was starting to think that Kolkata wasn’t such a great idea; dipping my toes in this city might result in losing my whole foot. This entry was posted in India and tagged Hindustan Ambassador, Kolkata. Bookmark the permalink. 3 Responses to I’ve Dipped My Toes in Kolkata. love the head wobble….it is the answer to everything! I love your title. Very creative. 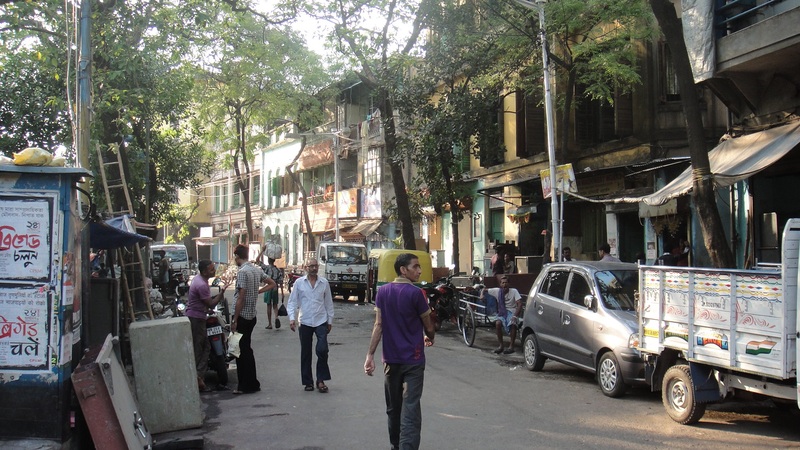 I have been to India once, but never Kolkata… but on my list. As so many places in India are. Thanks for the post.